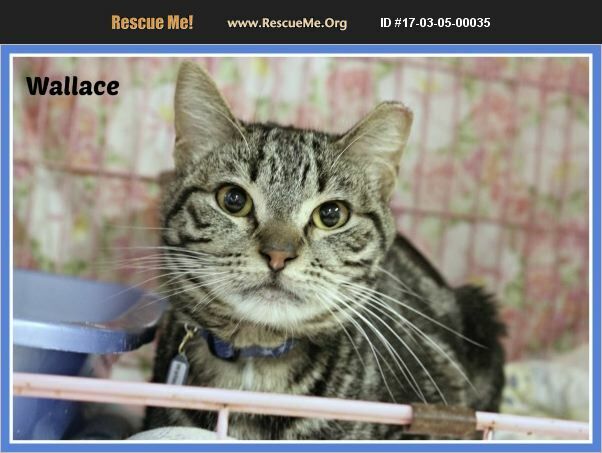 Wallace ~ Male, Brown DSH Tabby, 12 mos. as of Mar. 2017. Neutered, up-to-date on vaccinations and micro-chipped. Wallace was on the euthanasia list at the AHS as he was labeled unhandlable - we are here to tell you that is so far from the truth! This boy is the friendliest, cuddliest, sweetest baby you'd ever want to meet. He clearly was just scared in the surroundings he was in - less than an hour in our care and he was lovin' up on everyone! This little guy is simply amazing. We don't know why anyone would think his life wasn't worth saving but we are sure glad we gave him a chance at a new life. He is quite the amazing little fella! BEFORE CONTACTING US REGARDING WALLACE, PLEASE REVIEW OUR ADOPTION POLICIES AND PROCEDURES.